Patience is a film about the route and sites of W. G. Sebald’s The Rings of Saturn – a melancholic prose pilgrimage through Suffolk (and a little Norfolk) that he may not have walked, an account with odd untruths and wrinkles. All, if taken literally, at 4 miles an hour, a walking pace that reduces most things to a blur. A fuzziness across which one might write, free of many otherwise obligations in order to shoulder bigger ones (that’s the theory). And where the deep research emerges, anyone who has walked the same route will know that the information is on the public notice-board. But that’s the point – this isn’t local history. 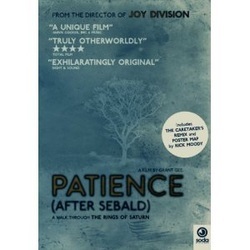 Patience has moments when it’s modernist theology gone mad; the talking heads – Iain Sinclair, Tacita Dean and so on - loom as if white-garbed, wandering off the set of Olympus in ‘Jason and the Argonauts’ or gods of Krypton in ‘Superman’ – Brando/Sinclair – Dean/York - but with ambient sounds substituted for Herrmann , these demi(more)urges easing through static monochrome scenes that seem to have been come peeled from the National Trust’s calendar of haunted properties. All that may sound like criticism, but the whole is so hagiographic, so absolutist, that it trips itself up magnificently – Sebald is alive and his commentator-Olympians are cinematic ghosts. A cruel, but necessary trick. Clever cinema. The whole is a negative of itself and as the film passes its halfway point it flips; the commentators disappear and the landscape – the great dictator – emerges. O, there is authoritarianism still – not in the sentimentality and opportunism of the Poet laureate’s account of his Granny’s suicide off Dunwich cliffs, but in the underlying fear of subsidence, of liquefaction, of the subsidence of everything – prose, humanity, fees. It’s Jeremy Millar that salvages the whole sublime wreck – conjuring Sebald’s moustache with a firework - a phantasm the film-maker can’t resist. On a personal note – we walked this route last year – and while we cannot subscribe to Katie Mitchell’s mantra for a perfect Sebaldian prose, every sentence perfect, we can agree with Sinclair who says ‘just walk it’. And suspect that what is most fabricated is least complete – and that that is maybe a better thing than immaculate (and unservable) sentences. The sands, the nuclear pagodas, the banal beauty of sands and bunkers that will kill us all.